Hi Gang – I am running another #AmazonGiveaway for: I Hero: The Beginning (Kindle Edition). There is no purchase necessary and you can be one of FIFTY prize winners in this give away. I am going to be working on this over the spring and I am pushing to release book three of the series on the same date that “I, Hero: The Beginning” released – May 21, (2015). PLEASE CONSIDER JOINING THE MAILING LIST AND ALSO FOLLOWING THIS BLOG TO KEEP UP TO DATE ON NEW RELEASES AND NEW GIVEAWAYS IN THE FUTURE! YOU CAN ALSO FOLLOW MY AUTHOR FACEBOOK PAGE AND FOLLOW ME ON TWITTER FOR THE MOST UP TO DATE NEWS AND INFORMATION ON MY PROJECTS AND CONTESTS! Keep in mind as well that I will be also working on book three of the As Life Goes series – “As Life Goes: The Reunion.” The target for that anniversary date of book one in that series “As Life Goes: Elementary” which was July 31, (2015). Book two of that series, “As Life Goes: The End of the Innocence” released November 27, 2015. With a little bit of a stretch, I might have book four, “As Life Goes: The Wedding” completed by then (that’s the goal anyway). Hi Gang – I am running an #AmazonGiveaway for: I Hero: The Beginning (Kindle Edition). There were over 10,000 nominations and votes. That list was shorted to the top 100 and from that the top 50 self-published books are showcased. Thank you everyone that voted to make this possible! This book will appeal to so many different people! What a great start to a series! Nathan isn’t a typical superhero, which I really like! The author did a great job twisting the plot to keep me – the reader – involved with the story, while introducing really unexpected events – um, Greek gods? How cool is that?. The book is very well written, and the author does a beautiful job of making this book accessible to not only adults, but a younger generation as well. With so much cross over reading between adults and youth these days, it’s nice to see one done really well. I’m excited to know there’s more coming in this series. With the release of “Nathan Returns” and “Phases” ahead of schedule I am please to announce the change in status of Nathan’s origin story in “I, Hero: The Beginning” as a fully permafree title. “Throughout the month of November, book lovers on Facebook, on internet forums, in book clubs across America, across the United Kingdom and across the world, discussed, debated and argued about self-published (indie) books. And then they came to ReadFree.ly to nominate their favorites. Thousands of nominations poured in. Vote for The 50 Best Indie Books of 2015: Fantasy – I, Hero: The Beginning is eligible; I hope you can support me by going to http://www.readfree.ly/indie50-vote-2015-fantasy/ and casting your vote for me and “I, Hero: The Beginning”. 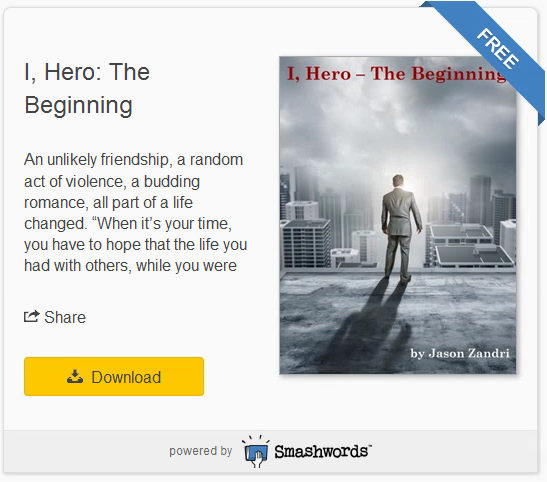 With the recent release of “I, Hero: Nathan Returns” and the upcoming release of “I, Hero: Phases” I am excited to announce that “I, Hero: The Beginning” is now available FOR FREE via the Smashwords website.